From first hand experience of healing myself of several conditions through diet and exercise, I can say that It feels amazing to be able to take power back into your own hands and control your health destiny and wellness as much as possible. Because when you first get diagnosed (or as in my case, slowly realise through multiple symptoms and exhaustive research that you have a particular disease), you can feel helpless and powerless. And prevention will of course, always be better than cure, and we really can drastically reduce the chances of being chronically ill with a whole food, plant-based diet. But it makes sense that the same foods that can prevent a disease can also fight it. If you have a chronic disease, then consult with your medical practitioner about the best course of action for you. I am not against western medicine. When it’s used responsibly it can be very effective. We know that it tends to treat the symptoms of a disease, which in some cases may be necessary. But you can also make a plan of action for yourself to treat your whole being, so that you can fight the disease more effectively. If, through diet, you can make your body an environment that doesn’t accommodate disease; that is hostile to it; then you stand the best chance of stabilising, reversing, or even healing it. Honestly, it’s difficult to choose which disease to focus on, as a plant-based diet is effective for damn near most of them. But for now, as with last week’s post, we’ll focus on a common chronic disease; one we hear an awful lot about and have possibly been affected by in some way already. We should really discuss prevention and healing together, as the same foods apply to each, but a here’s a little bit about prevention first. You know what’s coming but I’m gonna say it anyway – a whole foods plant-based diet is the ultimate cancer prevention diet. Now, you may well have some dastardly genes, but lordy, please don’t feed them sausage rolls. Even if you know you have inherited cancer genes, the truth is that they need never be expressed, and a whole food vegan diet has the power to stop them playing out. Here’s the study regarding prostate cancer and gene expression. Here and here is some info on breast cancer and gene expression. ‘…I am suggesting that nutritional inputs are the primary factor in gene expression, and that in the vast majority of cases, the vast majority of the time, good nutrition has a much greater impact than anything else – including the most complicated and expensive genetic intervention. It makes it easier to maintain an appropriate weight, and we know that being overweight is a cancer risk factor. It is full of protective vitamins and minerals and anti-oxidants. It is full of fibre. This helps food travel through the body in a healthy amount of time, and takes toxins with it. It contains phytoestrogens. These are plant estrogens that have a very different effect to animal estrogens. They stop our levels of estrogen getting too high (a risk factor for the reproductive cancers). It’s explained here. It is widely believed (and science points towards this) that cancers do not thrive in alkaline conditions. If we reduce the acid’y’ foods we eat, and maximise the ‘alkaline,’ we have the best chance of stopping cancer from appearing, or growing if we already have it. The most acid’y’ foods are meat, dairy, eggs, alcohol, coffee and refined starches. 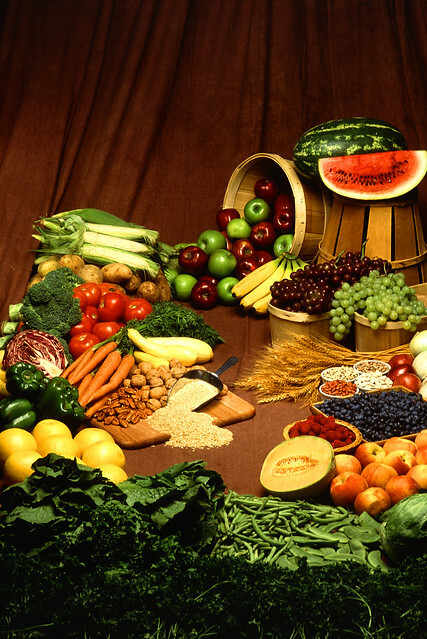 The most alkalising foods are veg, whole grains, water, most fruits, nuts and seeds. A plant-based diet to treat or help treat (along with conventional medicine) cancer should contain an abundance of green leafy veg, the darker green the better – kale, cabbage, brussels sprouts and broccoli are all great choices. Beta-carotene rich foods such as carrots, sweet potatoes, apricots and red peppers are protective. Calcium rich foods are also needed, such as green leafy veg, sesame seeds, tofu and seaweeds. Whole grains, oats, pulses and fresh fruits provide excellent fibre sources, and water and herbal teas ensure optimal hydration. A daily serving of ground flax seeds are important, for their lignan (lignans are anti-cancer) and super-fibre content. It may also be advisable to supplement with selenium and vitamins C and D.
Processed foods and sugar should be removed from the diet, and salt should be kept to an absolute minimum. Don’t forget, exercise and relaxation techniques also play a vital role in cancer prevention and treatment. This is just an outline. If you are considering making the life-affirming change to a cancer prevention/cancer fighting, ‘taking back the power,’ whole food plant-based diet, We can help you on your journey to your best health.